WHMCS allows your customers to transfer domains to and away from you via a varied array of registrar modules. To see if your registrar module supports Domain Transfers, you can visit the Domain Registrars page and then review the Supported Features chart. A domain transfer is the process of moving a domain from one registrar to another. Once a domain transfer has been performed, the registrar the domain was transferred to will handle all information pertaining the domain and its management. To initiate a transfer, an order must be placed for it. Customers can place an order for a Domain Transfer via the Client Area by navigating to Store > Transfer Domains to Us. Alternatively, administrators can place an order for a Domain Transfer via the Admin Area by navigating to Orders > Add New Order. If the "Allow clients to transfer a domain to you" option is enabled in the Admin Area at Setup > General Settings > Domains tab, then your customers will see the "Transfer in a Domain" option in the Shopping Cart. Customers can choose to transfer in any domains with TLDs that have pricing configured in the Admin Area at Setup > Products/Services > Domain Pricing. Please note that a domain transfer will be billed and performed for the shortest configured period. Once the order has been completed and paid WHMCS will initiate the transfer process, and the "Domain Transfer Initiated" email notification will be sent to the customer. To initiate a transfer away from WHMCS customer's will first want to ensure that their domain name is unlocked, and they will need to get their EPP code. If the registrar module offers the ability, WHMCS can lock or unlock the domain name for them. Customers that want to unlock their domain name can do so via the Client Area by navigating to Domains > My Domains, clicking on the domain, and then clicking on "Registrar Lock". The EPP code is basically a password for a domain name. It is a security measure, ensuring that only the domain name owner can transfer a domain name. Customers can retrieve the EPP code needed to transfer their domain to a new registrar via the Client Area as well. This can be done by navigating to navigating to Domains > My Domains, clicking on the domain, and then clicking on "Get EPP Code". Administrators can retrieve the EPP code from the Admin Area if needed. This can be done by navigating to the domain's page, and then clicking on the "Get EPP Code" button. Domain names that have not yet been successfully transferred from another registrar will have the "Pending Transfer" status. With the Domain Syncronisation feature WHMCS is able to identify when a domain transfer has been completed or failed. It will ensure that the Next Due Date, Expiry Date, and Status values are updated for domains on the installation. Most Registrar Modules support the Domain Syncronisation functionality, however not all do. To see if your desired registrar module supports this feature you'll want to click on the module on the Domain Registrars page and then review the Supported Features chart. 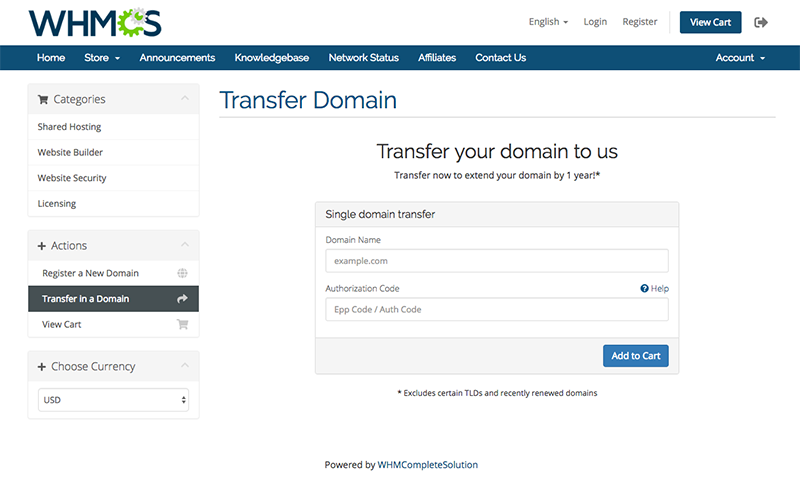 Once the domain transfer from another registrar has completed, WHMCS will send the "Domain Transfer Completed" email notification to the customer, and the domain will be set to the "Active" status. If a domain transfer from another registrar fails, then WHMCS will send the "Domain Transfer Failed" email notification to the customer to let them know and advise as how to proceed.